Running round in circles and the longest mile. I’ve been suffering from runner’s guilt all day. I woke up at nearly midday and realised I’d missed a fantastic morning for a long run. Then to rub it in there were runners out and about everywhere on our return journey to London and fellow janathoners were logging some great runs on twitter! There was still an hour or so of daylight left when we got home so I was keen to get out and do a quick run. 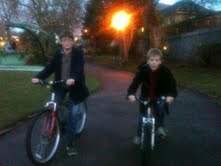 The boys also fancied some fresh air after a few hours in the car so out came the bikes. When tyres were finally pumped up and bikes manhandled out through the house we finally got going for the last 30 mins of light. 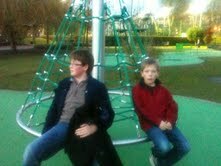 Not far from home is a small park which has recently been dramatically improved by the council. The boys like cycling around the perimeter path plus there are some good bits of equipment that still appeal to older kids. I planned to run circuits of the path while they cycled or stopped to muck about, assuming that I could ‘knock off a couple of miles’ in 20 plus minutes. Mistake. Monotony is the word! I began to think the nike gps was short-changing me… The 6 laps it took to run a mile felt as if I’d been running for hours. I reckon it must have been the ‘longest’ and most boring mile of Janathon to date. I won’t bother uploading a map of my route. Just imagine a rectangular park and then scribble lots of circles over it! I’d had enough after a dizzy mile and a half. It was also almost dark so I left the boys at the front door with Dad to struggle in with their bikes and went off alone for another mile in a nice straight line! 6 laps to do a mile? That’s worse than my local park in London; that was 4 laps for a mile. Well done. Laps are mind-boggingly boring! Oh dear! That does sound like a boring mile! At least my park is a 1km lap, so only 1.5 laps per mile. Poor you running can be boring enough without having to do laps, worse than school athletics. Well done for grabbing the last minutes of daylight.